I'm not sure what prompted me to make Sour Cream Cinnamon Drops when I saw them in Nick Malgiere's Cookies Unlimited. Perhaps it was the simplicity of the ingredients; the only thing I don't usually already have on hand was the sour cream. So I put it on the shopping list and set aside some time to get busy in the kitchen. These were easy to make, and did not take too much time. But the cookies were uninspiring. They weren't awful, or inedible. They were just . . . blah. They had a soft puffy texture that might have worked better if they had any flavor, but they were disappointingly bland. The recipe said to sprinkle the cinnamon and sugar over the cookies, but a sprinkle of cinnamon and sugar was too subtle to do anything more than hint at what could have been a better cookie. If I were to make them again, I would add a teaspoon of cinnamon to the batter. I think that would give them a flavor boost that would elevate them to a flavorful cake-like cookie that would live up to its name, rather than the puffy bland slightly cinnamony cookie that I produced from the recipe. So far I am one for two on Cookies Unlimited. Which seems to match the ratio of positive to negative reviews of the book on Amazon. I will be curious to see how the next one will turn out. Preheat oven to 375 deg. F.
Combine the flour, salt, and baking soda and mix well; set aside. Beat the butter and sugar together, then beat in the egg and beat until smooth. Add half of the flour mixture and beat until just blended. Add the sour cream and beat until the batter is smooth. Add the rest of the flour mixture. Drop heaping teaspoonfuls of the dough 2 or 3 inches apart on parchment-lined baking sheets. 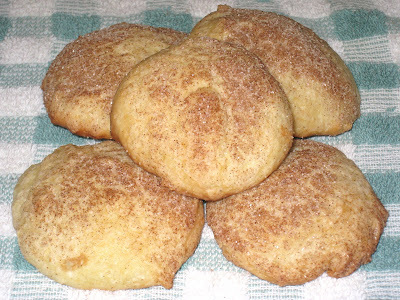 Sprinkle the cinnamon and sugar on top of each cookie. Bake for 12 - 15 minutes, until they have spread out but are still fairly pale. Do not let them get too dark. Remove from the oven and let cool on racks. Store in a container with a tight-fitting cover. from Cookies Unlimited, by Nick Malgieri (William Morrow Cookbooks, 2000). These cookies are doughy and flavorless. Did you forget the vanilla! I made and posted the recipe as it was written by Nick Malgieri. I did notice that the recipe did not call for vanilla, but I have baked other items that did not contain vanilla that were quite delicious. I do not think it was just a lack of vanilla that made these cookies come out less than stellar.